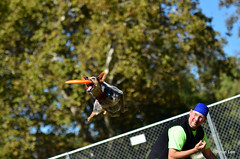 Vader's Disc Dog World: Dog Sports: Why Get Dogs a "Dog Disc?" 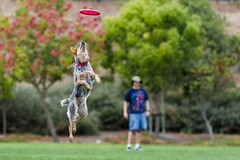 Dog Sports: Why Get Dogs a "Dog Disc?" 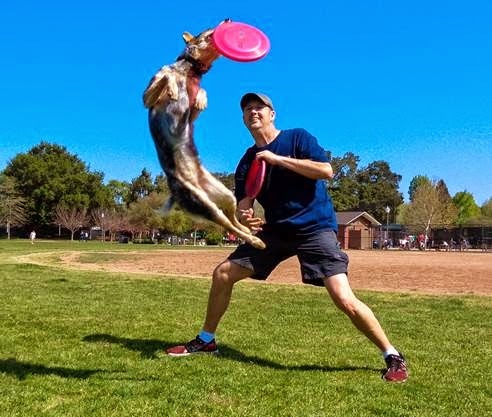 If you've ever chatted up a competitive disc dog player/enthusiast, you may have encountered the perspective that they use specific discs made for the sporting world of "Disc Dogs." 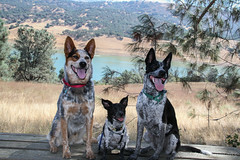 It's all about personal preference, but more importantly, it's about the safety of your pup. 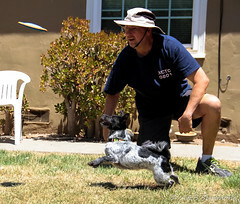 You'll also discover that there's a bunch of interesting info you might be interested in learning about this fun sport of disc dogs. As a dog owner, you have all kinds of options for flying toys for your dog in the pet store, and for the most part, they're all great options. 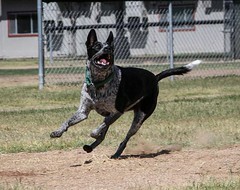 Most dog owners might go out once a day and spend a few minutes having their pup chase tennise balls, oddly shaped or flying and bouncing toys. It all depends on the pup. Having ended up buying several dozen discs over the last year (Probably way over the 100 count so far), I've settled on a disc model and brand that best suits my dog, Vader. 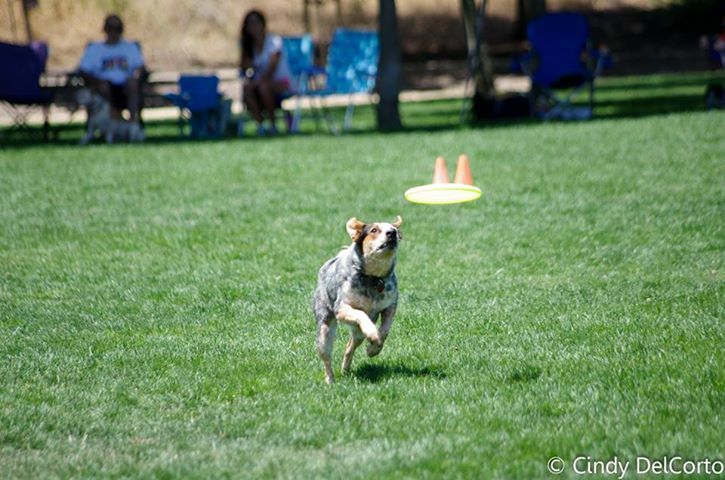 And choice of disc is just as much about preference, performance and dog favoritism as anything. The discs I use, I purchase from Hero Disc USA and they're called the Super Aero. They were softer than most discs and still have decent flight characteristics. Though to date, the Super Aero I fell in love with was the gen-1, and they've recently come out with a gen-2 which is slightly stiffer. Still a good disc, but my pup is very selective in his discs. So why dog-marketed discs? Here's a tale (not tail) of what I've learned along the way. First up, you might notice that dog discs are thinner around the edge. That makes it easier for the dog to grab and hold on to. Some regular discs (or Frisbees) can be pretty thick around the edge. Sure, I bet there are a few of you out there that say it's not been a problem. I understand that. But I'd hate to see you find out the hard way that it is or could be a problem. Dog discs range from a touch softer disc material to a much softer material. Or, as marketed, they're more puncture resistant than most discs. Some folks use the cloth discs but with Vader's hard chomping power, we've been warned that a cloth disc might not be best for him because there's no resistance for his chomping teeth, and thus, he could break his teeth. So we graduated from cloth to plastic dog discs. When we started using these, Vader was going through them pretty fast. I'd say one or two a week. That included our sanding down the edges. A standard dog disc, after one session, had dozens of jagged tooth holes. A Super Aero, being more puncture resistant, we might see one break in the surface of the disc after one session. I can attest, they last a lot longer than any other disc on the market we've tried. Well, to be more accurate, versus any other disc we tried out with Vader. Yes, I mentioned sanding the discs. As your dog catches discs, they will develop tooth holes that can stick up (or down) and create small, jagged protrusions. 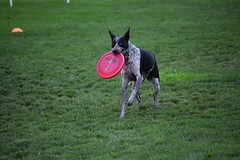 You don't want your dog trying to catch a disc that's spinning fast, with a jagged protrusion. That's a recipe for a cut! So we started carrying sand paper and after every session, we went over each disc and sanded down the protrusions. After a while, some discs just needed to be retired (called the recycle bin) because they become too tattered. As we asked around with other dog disc enthusiasts, we landed upon one recommendation from Robin at the "Indy Dog and Disc Club," to check out the Super Aero from Hero Disc USA. When my discs were only lasting weeks, I was told a Super Aero could last months. Obviously that caught my attention. HOLY CRAP, THESE DOG DISCS CAN BE EXPENSIVE! And now for a price trick we learned early on. If you start looking at dog discs, you might notice that if you have a disc-destroying dog, that $12-$18 bucks a pop. And at one or two discs a week, well, that can add up. One man I know was going through 500 discs a year/season! The cost effective resolutions are called misprints or blems. The distributor ends up with non-perfect discs. Sometimes it's the text on the disc that gets messed up and sometimes it's the disc itself that gets a blemish and can't be sold as the perfect conditioned disc. 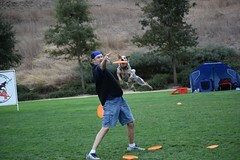 The discs my dog appreciates, the Hero Super Aero, cost $14 a pop, but blems only cost around $6, when they're in stock. The trick is to keep your eye out for when they show up. Oh, and when ordering blems at discounted prices, you don't have options for color... you get what you get. But that's worked out OK for us. And that's that, with our experience with learning what dog discs worked best for us and Vader. Every disc dog enthusiast will have different experiences, but the bottom line is the safety of our pups, first and foremost. Vader needs the or seems to prefer the softer discs. 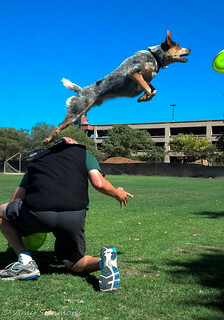 One friend I know, her dog is a big, powerful dog, but he barely even dents the discs when he catches them. So while I go through 3 to 5 discs a month, they've used the same five discs over the last few months. So not fair! LOL.